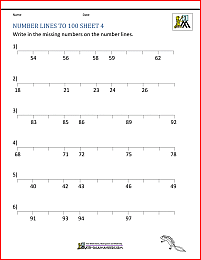 Welcome to the Math Salamanders Number Line 100 Worksheets. Here you will find a selection of free printable number line worksheets, which will help your child understand how to count on and back in 1s and understand number position to 100. Here you will find a selection of 1st and 2nd Grade Math worksheets designed to help your child understand how to position numbers up to 100 on a number line. We have a range of sheets with different start and end points, as well as blank number line sheets that you can alter to suit your needs. 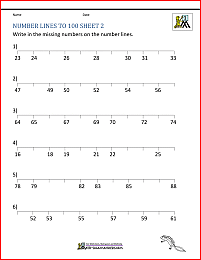 The first set of sheets involves placing and identifying numbers correctly on a number line with just 10 divisions. The second set of sheets is trickier and involves placing and identifying numbers correctly on a number line with 100 divisions. place a number correctly on a number line going up in 1s. place a number line correctly on a number line with 10 or 100 divisions. The sheets in this section involve placing numbers correctly on a number line with just 10 divisions going up in 1s. The sheets in this section involve placing numbers correctly on a number line with 100 divisions going up in 1s. They are quite a bit trickier than the sheets above. If you want to make your own printable number line sheets with a scale to suit your needs, then feel free to use the one below! 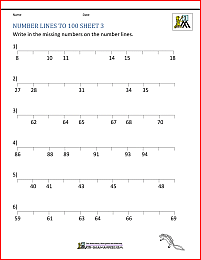 Looking for some easier number line worksheets? We have some easier worksheets that have a similar format to the sheets on this page, but with numbers up to 20. Here you will find a range of Free Printable First Grade Place Value Charts. 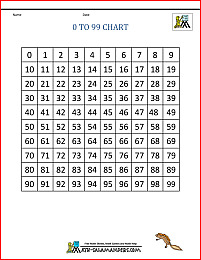 These printable charts will help your child learn to read and write numbers to 100. There is a selection of charts with numbers up to 99, and another section of charts going up to 100. Some of the charts are partially filled to help your child learn their place value to 100. All the charts support elementary math benchmarks. These sheets will help your child learn their place value, reading, writing and ordering numbers up to 100. 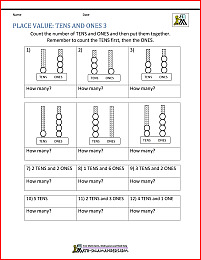 Here is our selection of measurement worksheets for 1st grade. These sheets involve reading scales going up in ones to find the weight or liquid capacity. Using these sheets will help children to consolidate their counting as well as learning to read a simple scale.